But unlike some chiropractic kids who grow up with wellness sewn into them instead of loving chiropractic because they see it radically change a life, Dr. Latimer was also blessed to see more than one amazing chiropractic miracle as a kid. When he was young, his mother broke her back in several places during an accident in a snowmobile race. She was completely paralyzed and in an ambulatory state for 6 months. Doctors said she would never walk again. “Do I even need to tell you the rest of the story?” Dr. Latimer likes to say, as he smiles and talks about his 78 year old mother playing golf 3 days per week, traveling the world, and doing all the things she should be doing right now as she enjoys this season of her life. 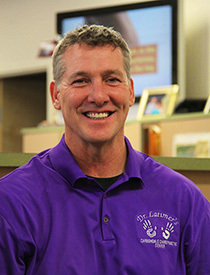 In practice now for over 29 years, Dr. Latimer graduated from National College of Chiropractic in 1988. The Carbondale Chiropractic Center office has been here for over half a century, and we are proud to serve Carbondale and the surrounding communities, changing one life at a time. Most of Dr. Latimer’s personal life is focused around his family. 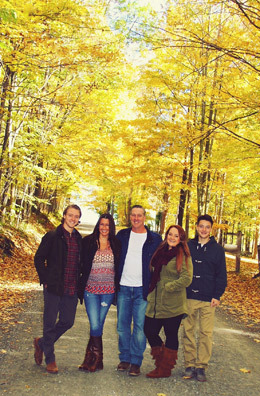 He and wife Samantha have a daughter and two sons – Giana, Elijah and Grayson – who they raise together in Susquehanna County. Dr. Latimer is passionate about the outdoors when he is not spending time with his family. “I’m looking forward to meeting you.” Call to schedule an appointment today at (570) 282-1240.